When I study Poland on a map, I imagine a large wolf reservoir. 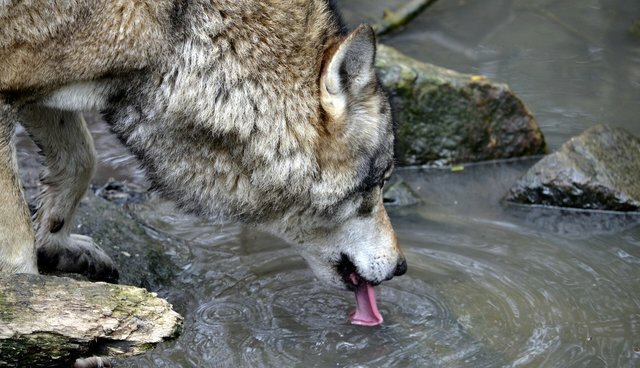 A stream of wolves from the Ukraine keeps the reservoir refreshed. A trickle of dispersers to Germany, Denmark, and the Netherlands keeps the reservoir from overflowing. About 1,000 wolves call Poland home; most inhabit the Carpathian Mountains in the south. Some choose the northeastern and eastern forests. Dispersers have crossed the country into western forests since 2005. "Compared with the rest of Europe, Poland is really rich in forests - they cover up to 45 percent of certain western provinces, Additionally, there is a large number of hoofed mammals living in our forests on which the wolves feed. This is conducive to the growth of predators' population." Countrywide protection since 1998 also helps. Some of these protected wolves now live near human settlements, creating a familiar problem: attacks on domestic goats and sheep. The government offers a familiar solution: reimbursement for producers who lose livestock to wolves. The country also has organizations that encourage nonlethal deterrence by educating farmers, training sheep dogs, building electric fences, and installing fladry. But - just as in the US - that's not enough for some producers who want to kill offending wolves and remove national protection. Hunters agree. Poachers take some wolves. Polish wolf management differs from that of the US in a couple of ways. Poland identified corridors that connect forests and contain trails that wolves' ancient ancestors used. Those corridors were officially protected. And just in time. "We are lucky," Dr. Myslajek told Polska, "that the building of expressways and motorways in Poland started after we learnt how large predatory mammals are distributed and what impact the fragmentation of habitats has on the animals. As a result, the newly built road infrastructure is accompanied by a well-developed system of passages for animals." The high-speed A4 motorway, for example, which runs along the base of the wolf-heavy Carpathian Mountains has wildlife passages. Scientists monitoring the A4 observed animals using the passages 5,000 times during one year. Poland also differs from the US in how the wolf population is counted. Before 2001, hunters did the counting - frequently overstating the population by as much as 100 percent, according to Polishwolf.org. Now, several organizations cooperate with foresters and conduct a regular large-scale - and more accurate - count. "It is impossible to protect wolves through establishing special protected areas for them. It is important to allow wolves to inhabit all suitable managed forests and to increase acceptance of these predators amongst local communities, mostly farmers, foresters and hunters. This is the reason why widespread education and extensive monitoring as well as resolving conflicts between man/wolf are fundamental to the long-term protection of wolves." Good advice for the US as well. Rick Lamplugh is a wolf advocate and author of the bestselling "In the Temple of Wolves." The book is available on Amazon as eBook or paperback. Or as a signed copy from the author.